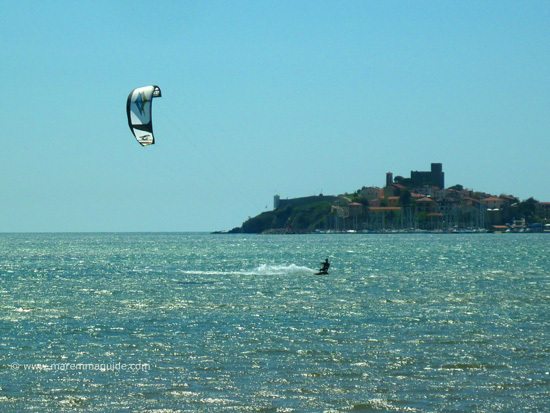 The best known, largest and first Talamone beach that you will see when you approach the town (there is only one road in and the same road out of this picturesque medieval coastal town) is the long and sandy shore of "Spiaggia Fertilia", famous for its perfect afternoon windsurfing and kitesurfing conditions. Indeed, the sign alongside the road calls it Kitesurfing Beach/Windsurfing Beach and there is a resident kite and windsurfing school on site - an international university no less! The sea water quality here is excellent. The beach is a sandy one which you will find after the winter covered in dried algae and Egagropili (Neptune's Balls, or better known locally as "palle di mare" - sea balls). The latter being a natural and very sensitive indicator of the health of marine conditions, as they only grow in the cleanest of sea water: there are lots here. The coastal waters around Talamone are home to "ricci di mare" or sea hedgehogs, the spiny Echinoidea sea urchin. So if you are going to go exploring the rocky pools, or surfing etc it advisable to wear footwear to protect your feet from their spines should you happen to land on one! Otherwise their shells are great finds along the shore for budding young scientists and collectors: wonderful holiday mementoes that don't cost a penny. 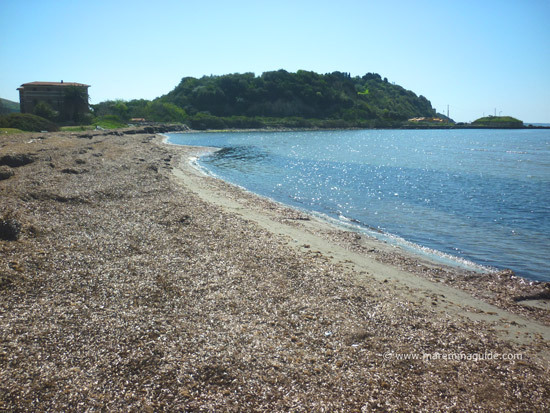 Although there are a few private beach areas along it's stretch - one "bagno" of which belongs to the Talamone campsite (see below) - the majority of this beach is public. The vast majority of the dune area - all that is accessible by car at least - is in private hands and a parking area. It is a fee paying car park: you will need to pay at the kiosk at the entrance. 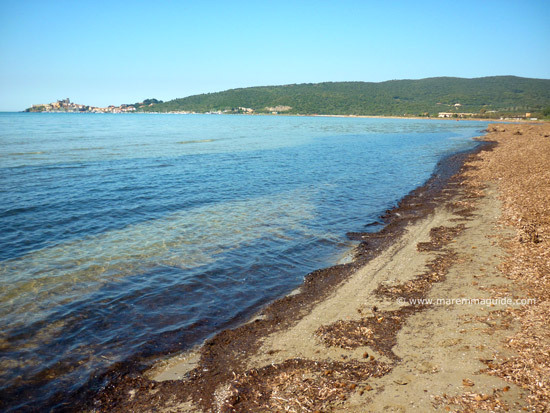 As you are driving towards Talamone, and after you have caught sight of the sparkling sea and Talamone sat on the promontory in the distance, the car park entrance is immediately on your left as you are level with and first glimpse the stretch of Spiaggia Fertilia beach. If you pass it and decide that that is where you want to be, you will need to go into town to turn around (unless you take advantage of the entrance to the beach apartment complex called Residence Talamone Il Poderino just a little further along). The base of the Gulf is very low and the waters shallow: making for ideal conditions for wind and kitesurfing. The school on the beach is ASD International Kitesurf University. They offer a variety of courses and lessons, including some for children. The "Talamone residence" (in Italy, "residence" is a hotel that combines traditional hotel room accommodation with self-catering apartments) of Residence Talamone Il Poderino is set just a few metres back from the shore. It has a large communal garden, terraces and barbeque area, ample parking, and offers bedroom accommodation as well as independent apartments. All ensuite, air-conditioned and with free wi-fi. The apartments also come with their own private terrace or veranda. 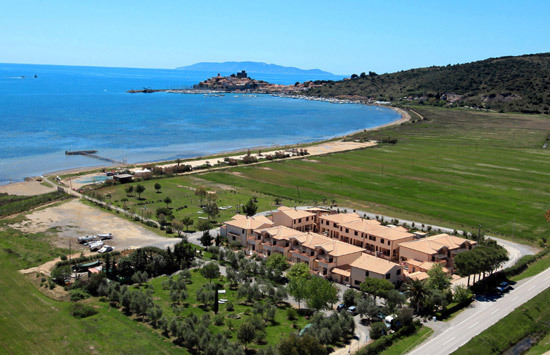 If you are looking for a camping option, then, although it isn't located right on the beach, Talamone Camping Village isn't far away. 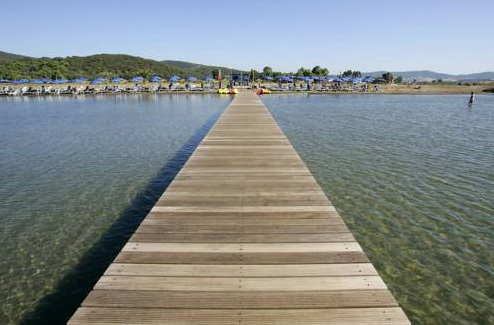 Situated further along the road into town in the shade of the Mediterranean macchia on the other side of the road, the camping complex (self-catering bungalows, camper van, caravan and tent pitches) has its own designated Talamone beach area with Caribbean-style thatched parasols and wooden jetty.